Being a long time Segway ‘appreciator’ (is that a word?) I got a nice laugh out of this particular vehicle this morning. Looks like GM (even tho its terribly in debt) has time to meddle in the niche market of electric scooter-vehicles. 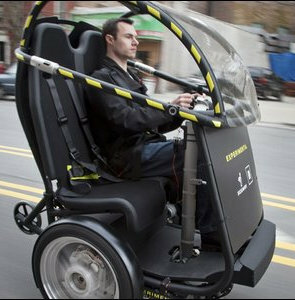 So they have teamed up with Segway to create a little deathbox, that does 56km/h (35miles/h) top speed. The prototype, which will be debuted in New York, is aimed at urban driving. GM aims to start making them by 2012. The vehicle, named Puma, can go as far as 35 miles on a single charge. It will use lithium-ion batteries. GM, having been bailed out by the US government as car sales have dropped, is looking to smaller vehicles to secure its future. Puma stands for personal urban mobility and accessibility. Cool little vehicle but I question the direction that GM is taking right now by getting sidetracked with these irrelevant projects, after all they are only in business because the US tax payers are forking over $13B dollars. Previous: Am I just cheap? Or are all the ‘free’ Apps “lite” now?